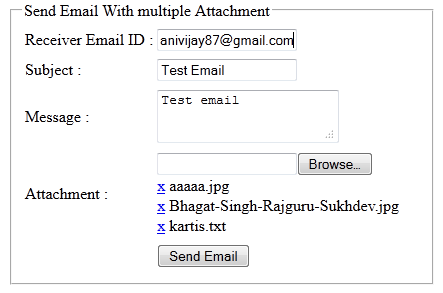 In the previous article I have explained How to generate strong random password in asp.net, Send email tomultiple users selected in gridview using asp.net (C#, VB) , Take automaticsnapshot (screenshot) and email it using asp.net (C#, VB) and Create Temporary table dynamically and bind to Gridview in asp.net. Step 1: In your application add a new folder upload. Step 2: Download the jQueryMultiple File Upload Plugin and add the file to js folder of application. Dim Uplodefile As String = Request.PhysicalApplicationPath + "upload\"